A small shoebox-sized satellite has recently proved that studying solar phenomena is not reserved only for large space observatories. The NASA-funded Miniature X-Ray Solar Spectrometer (MinXSS) is providing invaluable information about solar flares coming from the Sun, which could shed new light on these violent and energetic events. “The new solar soft X-ray spectral irradiance measurement from MinXSS is starting to answer questions about solar flare energetics, including plasma temperature, density, and composition,” Tom Woods, MinXSS Principal Investigator at the University of Colorado Boulder (CU), told Astrowatch.net. MinXSS was launched to the International Space Station (ISS) on Dec. 6, 2015, aboard Orbital ATK’s Cygnus spacecraft. It was deployed into space from the ISS a few months later on May 16, 2016, to begin its science operations on June 9, 2016. 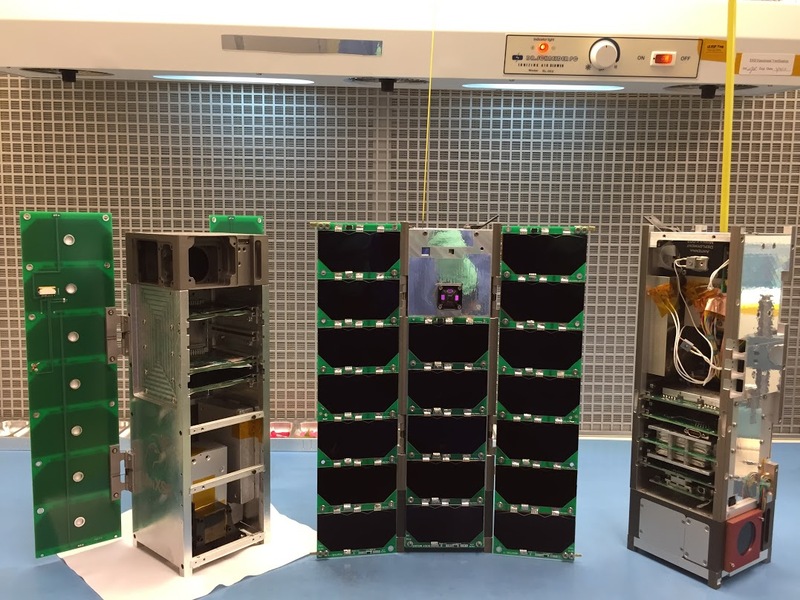 Weighing around 7.7 pounds (3.5 kilograms), MinXSS is a three-unit CubeSat with dimensions of 13.4 by 3.94 by 3.94 inches (34 cm × 10 cm × 10 cm). It was built by a team of over 40 scientists and engineers at the CU’s Laboratory for Atmospheric and Space Physics (LASP). “From an education point of view, it is one of the most important student projects at LASP that has involved 45 students over the past five years,” Woods said. MinXSS uses its Amptek X123-SDD (silicon drift detector) soft X-ray spectrometer to study the Sun’s dynamic processes, such as solar flares, in order to further understand how these events influence the Earth’s atmosphere. With a mass of only 0.7 pounds (0.32 kilograms), this instrument is providing advanced spectral measurements of solar soft X-rays. Lately, this spectrometer has observed a low-intensity solar flare, providing crucial data about its energy and brightness. These observations show how dynamic the solar atmosphere can become, and they confirm that MinXSS has great sensitivity to observe even weak flares erupting from the Sun. This video was made using MinXSS data from a low-intensity solar flare that occurred on July 21, 2016, from 1:33–2:23 UT, and imagery from NASA’s SDO. On the graph, pre-flare levels are shown in red, and the yellow line is the flare spectrum in real-time. MinXSS saw energy and brightness increase during the solar flare, which is apparent in the corresponding SDO images when a loop of solar material rises from an active region on the Sun and shines brightly. Scientists use these flare measurements to trace the temperature, density, and abundance of solar flare material during a flare. Data acquired by the Amptek spectrometer could improve our understanding of flare heating processes, temporal evolution, and elemental abundances. The measurements made by MinXSS are also important for scientists to update solar irradiance spectral models and to use such results as input for terrestrial and planetary atmosphere models. “The MinXSS CubeSat mission is an important mission for NASA as it is NASA’s first science CubeSat mission for the NASA Science Division. The previous NASA CubeSat missions have been for technology demonstration. MinXSS has demonstrated that high-quality science can indeed be done aboard a CubeSat,” Woods noted. So far, the MinXSS CubeSat has observed more than 40 C-class and seven M-class solar flares. The largest flares observed by the spacecraft to date occurred on July 23, 2016, with an M5.0 flare that peaked at 02:11 GMT, an M7.6 flare that peaked at about 05:16 GMT, and an M5.5 flare that peaked a few minutes later. “The MinXSS Cubesat is the first flight of the Blue Canyon Technologies attitude determination and control system that has the best-ever 3-axis control for CubeSats. It is providing about eight arc-second pointing stability for the MinXSS solar observations,” Woods said. Meanwhile, the LASP team is developing the second MinXSS CubeSat. The new spacecraft is slated to be launched in April 2017. MinXSS-2 will be equipped with an upgraded version of the X123 spectrometer, called the Fast SDD, which has lower noise and wider dynamic range for enhanced measurements.